Risk Assessment: a 4 step approach to identify, categorize, assess and mitigate the risks. Test Strategy: to build a suited risks mitigation plan. It contains a master and a detailed test plan. Risk Radar: an innovative dashboard providing the project’s current and historical status using a graphical radar representation. Test Estimation: to estimate all the required testing effort (planning, preparation, execution, reporting). Every involved team and person can estimate its own activities. Test Results: the test results can be synchronized with testing tools like HP ALM, or can be manually added. 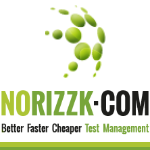 All results are linked to the complete test strategy and all the applicable risks. The status will be available in the Risk Radar. Test Plan Generation: although the complete test strategy is automated, the platform still foresees the option to generate a test plan in MS Word format. Test Intelligence: the platform contains information (generic IT risks, sector/technology risks patterns, assessment benchmarking, risk categories, test types, activities) which continuously is being updated and extended in a semi-automated way. HP ALM Integration: The test results from HP ALM Test Lab are integrated back into the Test results matrix in Norizzk.